One of the AD200 Pocket Flash's interchangeable heads is the H200R Round Flash Head. Designed for it, thisGodox AK-R1 Accessory Kit for H200R contains magnetically-attached modifiers that maximize the capabilities of the head. The kit contains a snoot, four-way barndoors, and a honeycomb grid to narrow the light's beam and selectively light your subject. Conversely, a near-180-degree dome, a wide lens, and a bounce card with a frame are provided to expand the beam. 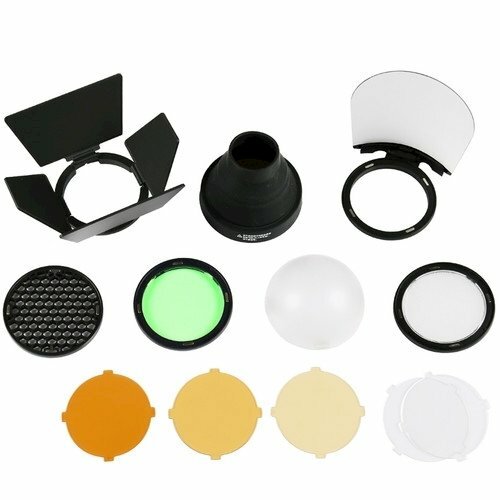 Finally, a filter set with three amber CT filters and one green fluorescent filter are also included.